Bloggers are the influencers who made the first step into the digital world. Bloggers are users who are specialized in their verticals and closely followed by their followers. Many of these bloggers now want to meet their followers through different channels that have also opened Instagram and Youtube accounts. It's easy to communicate with bloggers who create the best quality content in their industry. You can sign up for a new campaign right away and bloggers can send you a proposal. The abbreviated version of the web log blog, network log It means. Blogs that have more space in our lives with the development of Web 2.0 technologies; has encouraged internet users to keep their personal diaries on the web because it is a hierarchical sort of sharing environment where messages are as easy to use as anyone with a basic technology literate, and that sets the stage for freely expressing any desired subject. According to their content personal, thematic, community and Corporate blogs divided into 4 different categories; nowadays, there are situations in which people can quickly access information about their interests. Blogger; is someone who keeps his or her ideas on his blog in his own style using any weblog service. Blog authors themselves determine the topics they want to write, their style of writing, and their working hours. Experienced and knowledgeable bloggers who have trained themselves in the field are interested in wider masses over time influencia is they can be identified and can deal with brands. Today, you can also be an Instagram blogger by sharing your photo blogs on video blogger (Vlogger) or Instagram by drawing videos on Youtube. Likewise, Twitter is a day-to-day task where you share short narratives. Whatever you are doing with your blog, you can hear your voice more broadly. What should you do to become a successful blogger followed by millions of people? Name: Blog name easy You may be remembered, short and self get. You can choose a name that reflects what you are going to do in your blog. If you have a blog on recipes "Selin's Kitchen"For your blog, where your fashion ideas are,"It's Your Style With Pelin"And so on. selecting a name will make it easier for users to find you and make your blog a concepts attract more attention by sitting on it. Theme: Choose your blog theme according to what you are doing. Things like color and font the spirit of your blog You reflect. If you are using WordPress service for your blog as you will get free themes, you can also buy paid themes for every taste and subject. Remember: When choosing a theme responsive (mobile-compatible). Spelling: You must comply with the writing rules in your blog content. Check the TDK for the words you are unsure about. Make soft transitions between topics in your content. Track your entry, development and outcome planning. Be careful not to use low or transpose clauses. Your cues should be as regular, understandable and fluent get. Content: Process the topics you have covered in detail in your blog. Do not be afraid of long writings. Because Google loves long texts and makes it easy to grow in search results. Readers who access your content do not have to search on Google, but you will be required to post all the information they need. Explain foreign terms or less well-known concepts in footnotes or in parentheses. If you have already written a detailed article about the topic, you can link to those articles. This will increase your reading rates and your number of followers. Specify links with an appropriate color in your blog template so that users know where to click. Select your content headlines in a remarkable and concise summary. Your content style sincere, natural and accessible Your followers can see you as one of them. While blogging your content hikâyeleştir Up You can also use art to make it more interesting. Information: Your articles, images, videos and links must be relevant, informative and attention-grabbing about the topic you are working with. You do not have to be formal when giving information. You can also use fun and enjoyable videos. Whether I've found your blog as a result of a search on Google, whether it's your followers for a long time, you should keep it fresh and present all the information you need in your content. Nowadays everyone writes in every subject. What will you be aware of? Millions of people are working on the same topic. What can you offer me as a reader? Why should I follow you? Your readers reflect your soul, your accumulation of knowledge, and your true experiences, so be indispensable. SEO: Learn the SEO rules to move your blog up in Google search results and reach more people. (See: What is SEO?) You can use the Google AdWords service to get ads in your blog. (See: How Google AdWords is Used) Before you publish your blog posts, you can make it easier to index them on Google using related tags. Do not forget to use hashtags when sharing in Twitter and Instagram in the same way. Influencer Blogger: Influencers are the eyes of the Internet authority and followers. (See: These Influencers Who Drift After Millions Da Kim Who?) Instead of being an ordinary blogger influencia is Get out of your competitors in your identity. Social media: Keep track of which blog you have on which platform, feed your blog using other social networks and expand your target audience by reaching more people. Publicize your content by sharing on different social media platforms. Remember that each social network has its own rules. Learn these guidelines and design your content the right way. (See: Being Famous in Social Media) Fill in the biography section of your social media accounts to reflect your content and make it available to more people using related labels. In order to be a successful blogger on platforms like YouTube, Twitter or Instagram, you should follow similar content rules. (See: Being an Influencer in Instagram) Images and videos you share extraordinary, taking attention, informative or entertains it must be quality. Even if you share your humorous content, benefit presents. The important thing is to do what no one else does and to present a visual feast with high resolution subjects. Use whichever platform you use sincere you must be by your followers accessible be. Take care not to leave your followers' questions and comments unanswered; instead of a top-facing language "I am you too! "A style that gives you the message. Try to answer some very specific messages at your time, or answer all of them on a video you have prepared by accumulating all the questions. Never buy fake followers especially on platforms like Instagram. Time to target organic growth loyal and a real audience Learn. How To Become An Influencer Blogger? Influencer blogger your blog content to be sincere a dille embroidered, detailed information should give your actual experiences reflecting confidence and first of all your readers benefit You must provide. You presented by offering alternatives or tricks that you have never seen before in your work bring utility to be interesting. You can increase your reading rates by following the content and visual rules. Your inner world is the reflection of your identity. Own personal brand Build your identity so that you can shine through millions of your competitors. Answer absolutely any comments. By embracing your readers as if they were your family, value give, your problems Answers The presentation. Make mutual communication sustainable. your content original, net, sincere, understandable, solution offering and striking be careful. Between you and your followers confidence and loyalty create the environment. Whether you want a blog service, use social media networks like Youtube or Instagram, niche content share a successful blogger you start attracting more people and brands. Avoid content that would not benefit your followers when evaluating offers from brands. Compatible with your personal brand and collaborate with brands that appeal to followers. Thinking like a regular advertiser when preparing sponsored brand content creative fiction Do not compromise your sincerity and nature. By using labels such as "paid collaboration with the X mark" you can get rid of negative reactions like "purchased influencer". Do not promote any products, services, or services that you have not experienced yourself and are not satisfied with. Remember that your priority is to give the right of the influencer, offer virtual benefits to the community and personal brand image It is to protect. If you want to reach brand faster CreatorDen influencer marketing platform you can instantly view the offers of hundreds of brands as you register, and start creating your content right away by selecting the campaigns that fit you. 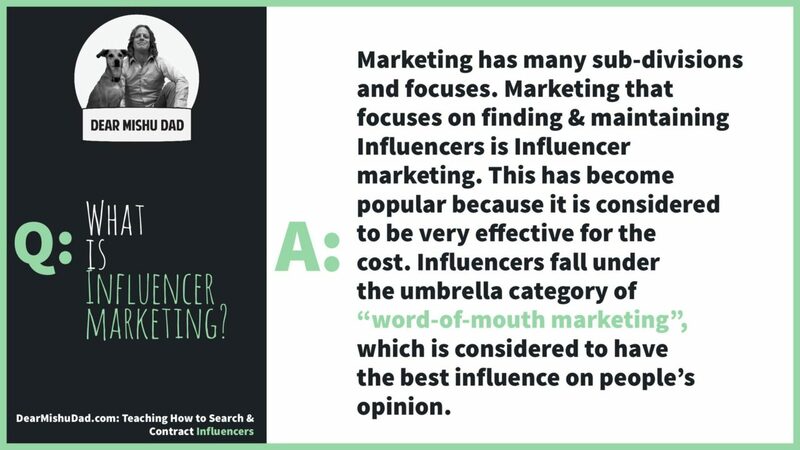 Likewise if you are a marketer and an expert in the field, influencia is have an identity Collaborate with bloggers If you want to do here you can reach hundreds of influencers as long as you reach a single person by clicking. Regardless of the sector, millions of counterfeit products in the ecosystem in the ecosystem to stand out from the competition, brands need to draw attention by doing extraordinary things. In recent years, brands that cooperate with influencers who are dominant in the internet are not only satisfied with their target mass, but also expanding the circle to reach new customers. (See: Brands Holding Brand Awareness with Influencers) While the share of a brand's social media does not attract much attention, influencers share viral links to millions of people. Today, even famous international brands make a face of influencers instead of ordinary celebrities, drawing a more intimate and accessible picture to their target groups. (See: Multi-Million Dollar Empire Quran Markets With Influencers) In this context influencer marketing; who want to grow faster and more organically, to secure consumer confidence, to reach a loyal customer base, and WOMM (mind-to-mouth marketing) strategy is the most effective content marketing method for today's brands who want to create effective marketing campaigns.